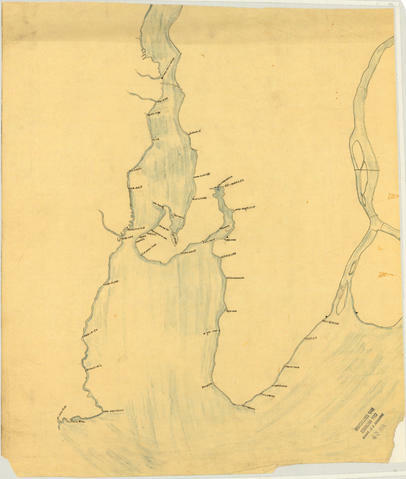 The map is a draft of map 56.01, "Indian villages and landmarks, Burrard Inlet and English Bay, before the whiteman came." It shows the geographic area bounded by the north shore of Burrard Inlet, the Fraser River, Point Atkinson, and the Burrard Inlet Second Narrows. Shown on the map are coastal sites labeled with First Nations place names. Map 56.01 is the completed version of this map. Map 56.02 is another draft version of map 56.01. Map 56.04 is a table giving English translations of First Nations place names. Correspondence associated with this map can be found in 847-A-3, folder 35.